Electricity can be dangerous stuff, particularly if you live in an alternative universe where the use of electricity allows monsters called Mangleborn to rise from their underground prisons. The original League of Seven were great legendary heroes who trapped the monsters, but when Archie Dent's parents become mind controlled by newly escaped Mangleborn, he has to be a hero to protect himself, his new friends and save his parents. 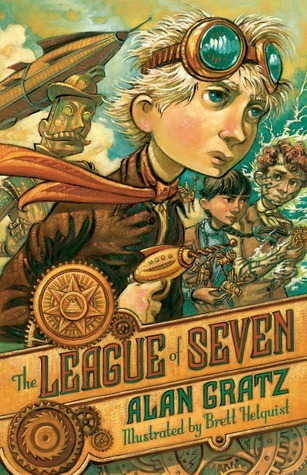 The League of Seven is set in a great steampunk world, with wonderful clockwork robots and airships. But what really makes this adventure stand out are the set pieces, like the mob attack on the girls school (which ends spectacularly badly for the mob). There's a real sense of victory every time Archie and his friends overcome another obstacle. But are they the new League of Seven? How can they be if there's only three of them? Special extra points go to this book for a cameo from Nikola Tesla. Who is always entertaining.